I like the cover, very colourful without looking cluttered. Love the Cover, and love the F-zero feature. Can't wait to get into it. Amstrad Gx4000 was a nice surprise as I was unaware that there was an article about it this month. Future classics has made me wnat to go back and finish the last few races on Blur. Based on the list of contents in the first post I'm mostly interested in the "The Making Of: Xenophobe" article. Nothing else that seems interesting this month. Love the cover, really took me back to that wonderful time in April 1992 and the SNES launch, a really good issue all round, always good to see more of the PC Engine, Max Payne was a great read, makes me want to go back and finish the game off, yet another title I started, enjoyed, but did not finish. Excellent article on Xenophobe from the Laird, a real favourite of mine, loved it on the Spectrum, then went onto the beyond superb Lynx version, and have recently been enjoying the 7800 one, would really like to try some of the other versions too now, the piece really got the whole story behind the title, I will appreciate it even more now, so thanks Kieren. Top 25 titles for the ST, just brought back so many memories, really have to track down Oids, but along with Vroom, it is just not easy to get hold of anymore for the real hardware, one copy on the net at the moment, but I ain't paying £80 for it. The GX4000 was another great piece, it's a console i have only recently got hold of, only managed to get a couple of games for it, as the best ones go for insane money, always wanted one back in the day, purely for the look of it. Making of Dungeon Keeper, yet another game I played to death years ago, and once again very interesting how it came together. Also like this peripheral vision, the Master System phaser is the only one I still use regularly. An awesome issue, congratulations to all. Anyway happy to get the new issue. Good to see a Speccy fan on Collectors corner. Never had a SNES so i wasnt caught up in the F-Zero hype but do enjoy playing that via emulation. Repton - Love this old classic, got this on my iphone, prefer the retro graphics for sure ! A classic game. Wow, another issue packed with variety. 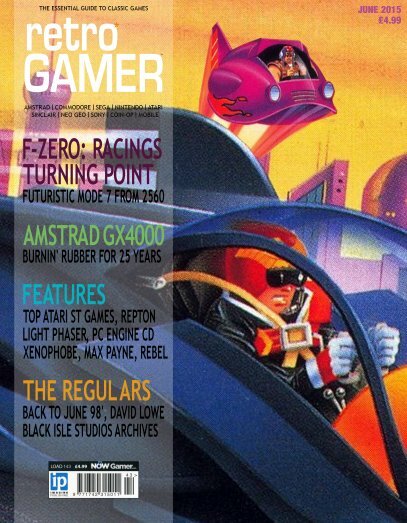 F-Zero article was great, loved all the Making Ofs and Repton has long been a favourite of mine. Just one minor point - the C64GS did not "add" a cartridge port. The C64 always had one. The GS moved it to the top of the machine. Just one minor gripe, I found it very hard to read the writing by the screenshots in the Dungeon Keeper article. Last edited by PostieDoc on Fri Jun 19, 2015 7:12 am, edited 1 time in total. PostieDoc wrote: Just one minor gripe, I found it very hard to ready the writing by the screenshots in the Dungeon Keeper article. I've had this problem for months on some articles. I've put it down to colour schemes, smaller fonts, failing eyesight, poorer print quality, but I really struggle to read the photo captions. Surely if they can waste 2 whole pages with pictures of every space craft ever in F-Zero (especially when they all look the same but with different colours) then they can make the font a bit bigger. It must be about size 4 in the font size world. Guy that featured in the GX4000 article has just doen a follow up video on Youtube. Apart from Repton (8-bit), GX4000 (8-bit), Light Phaser (8-bit), Master Of Darkness (8-bit), Xenophobe (arcade and 8-bit), Tusker (8-bit), Stryker's Run and Powerplay (8-bit) you mean?